Swami often asks young boys, "How many brothers do you have?" Boys invariably reply along expected lines by saying two, or three, etc., as is the case. Swami then smiles and softly whispers, "All are your brothers!" After this He asks of another boy, "How many friends do you have?" Taking the cue from the earlier conversation, this second boy would say, "Swami, all are my friends." Swami would again smile, and gently say, "No, all are not your friends; God alone is your friend!" During the period the Super Speciality Hospital in Puttaparthi was under construction, Bhagavan was quite busy and could not spend as much time with His students as He normally did. In the afternoons, after Darshan and a few Interviews, He would be closeted with doctors. One day, after giving Darshan and receiving letters from the public as well as students, He adjourned as usual to the Interview room. Suddenly He came out holding a letter in His hand. Waving the letter He went towards the students and asked, "Which of you wrote this?" Hesitantly, one boy got up. Swami asked, "You wrote this?" Meekly the boy nodded his head, fearing the worst. 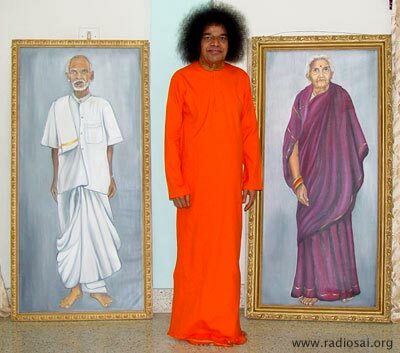 Swami then turned towards the elders in the veranda and said, "This boy is a student here. He is very keen to contribute to the Hospital Project. In this letter, he says that he is not a doctor and therefore cannot contribute service. He is not a rich man and therefore cannot make a donation. He is only a mere student. Yet, he is keen to do his bit. So, what does he do? He saves his pocket money, collects hundred rupees and gives it Swami." So saying, Baba pulled out a hundred rupee currency note from the envelope in His hand and displayed it to the devotees there. Bhagavan then slowly added. "For Swami, these hundred rupees represent pure Love emanating from the heart. They are therefore far more valuable than a big donation made perfunctorily." God always cares only for quality and not quantity. Once in Brindavan, as Bhagavan Baba was coming out for Darshan, He saw four boys standing. Swami stopped and asked one of the boys, "What is your name?" The boy told Baba his name. Swami then asked the same question to the other three boys. Two of them gave their names but the third one said, "I am Swami." Baba then told that boy, "In that case, go and give Darshan!" and moved away. Man certainly is an aspect of God. In fact, as Swami says, man is God. But this fact must be realised in the heart and not merely understood in the head. And having realised this basic truth, man must always have that Godly feeling. Merely declaring, "I am God!" will not do. 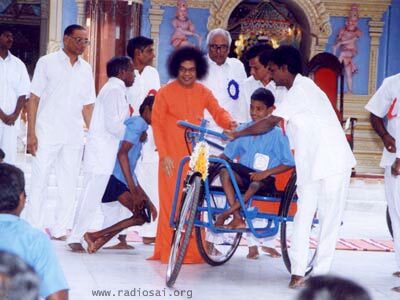 Swami loves children and can be frequently seen talking to them [especially the Birthday boys] in the veranda in Sai Kulwant Hall in Prasanthinilayam. A favourite question of His is: "Boy, how old are you?" When the boy concerned replies, Swami's next question would be: "How do you know?" Invariably the answer would be, "My mother told me." Swami would then smile and remark, "Yes, it is always the mother who is the first teacher." Changing the subject, Baba would then ask: "Where do you come from?" Quick would come the reply: "Swami, I have come from You!" Swami would laugh and then say, "I just want to know where you were born." After a bit of light banter like this, Swami would then ask, "Who am I?" Without any hesitation, the boy answers, "Swami, You are God!" Swami would smile, pat the boy and slowly say, "You also are God!" It is a common sight in Prasanthinilayam to see Swami distributing various things. No one can say what He will give, to whom He will give, and when He will give; but that He will give, one can always be sure of. 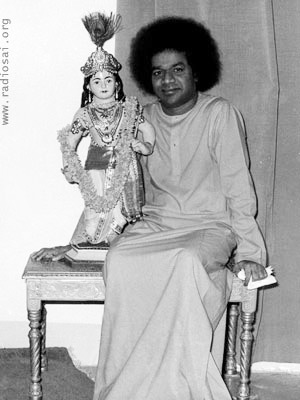 Swami distributes all sorts of things; these include fruits of the season such as oranges, mangoes, papayas, and apples. Once He even distributed water melons! It is not just sweets, biscuits, chocolates, and the like. As birthday time approaches, the items distributed can be clocks, watches, calculators, cameras, shirting pieces, dhotis, sarees, sewing machines, push carts [for vending], hand-pedal cycle carts [for the disabled] - you name it. At new year time it is often calendars and diaries. So on it goes, not only in Puttaparthi but also in Whitefield and in Kodaikanal. Swami does this because He wants people to remember that man is born to give and not to GRAB [which is what is happening most of the time these days]. Further, one must give not out of a sense of condescension but with the idea of filling the heart of the receiver with joy and happiness. Some people crave to accumulate wealth. Swami is very critical of this, adding that wealth accumulated is like dung piled up in one spot; it will only radiate foul odour. But if the same dung were to be scattered on a field, it would result in a good crop. This, says Baba, is also true of wealth. If money is hoarded in a bank, it will benefit no one but if it is spent for the benefit of the community, it would bring prosperity to all including the one who is spending. God does not mind if people do not realise who He is! In the celebrated Bhagavad Gita, Lord Krishna says that when God comes in human form, most people mistake Him to be just another man. This frequently happens in the case of our beloved Baba also, notwithstanding His innumerable miracles and Leelas, all of which are a clear signature of His Divinity. There is a charming incident that highlights this human fallibility. Many decades ago, Swami visited the house of a devotee in Bombay. Over there, Baba moved about very freely with the members of the family, as He always does on such occasions. Among other things, He spent some time walking to and fro with the aged mother of his host. 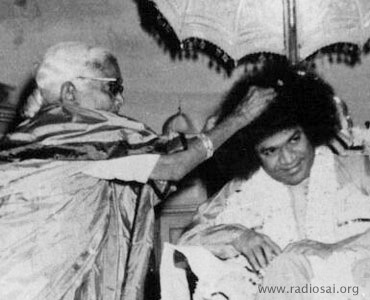 This old lady was so happy that in the end she placed her hand on Swami's head and sweetly said, "God bless you!" Ancient Indian scriptures say: "Mother is God, Father is God." The Bible says: "Honour thy father and mother." In the past, aged parents were cared for in all societies. But alas, in modern times, people seem to think that aged parents too must be cast away like worn-out clothes and appliances. Since longevity has increased, the problem of aged and abandoned parents has become an acute problem, especially in the developed countries. Sons and daughters who owe their very existence to the sacrifices that their parents made for their sake, abandon their parents without batting an eyelid. Thus it is that Homes for the Aged and the Destitute have sprung up all over the world. Swami constantly reminds all devotees and particularly students, that they should never forget the debt they owe to their parents. He says that when we rent a house or a room, we pay rent to the landlord. Likewise, we must pay "rent" to the [maternal] parent for occupying the womb for nine months at a stretch. In His typical fashion He adds: "Parent means PAY RENT!" In 1999, Swami set up a Home for Destitute Parents near His Brindavan Ashram. The message has since gone home and now many Seva groups have done likewise in their respective areas. Swami has the power to control Nature but He rarely interferes with natural phenomena. His argument is very simple. He says, "I have ordained the forces of Nature and they have their duties to perform. However, when it becomes absolutely essential for the welfare of mankind, I intervene in a benign manner." As young Krishna, he lifted an entire hill to protect the people of His village from a deluge. As Sai too, He has several times done similar things. One example is provided by the floods of 1973. 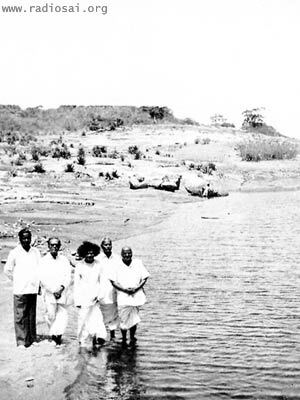 That year, thanks to very heavy rain, there was an unprecedented flood in the Chitravathi river. Water submerged all the low-lying parts of Puttaparthi, and came right up to the Ganesha and the Gopuram gates. The Ashram being at a relatively higher elevation, the flood waters had not yet entered its premises, but were threatening to do so. Meanwhile, all the villagers flocked into the Ashram seeking shelter. The compassionate Bhagavan not only allowed the villagers to take shelter but also provided them with food. The weather continued to be inclement, and it appeared as if the water level might rise even further. At this stage, Baba went to the East Prasanthi block of flats, and climbed up to the terrace. From there He looked down at the overflowing river, and whispered something. People nearby could not make out what Swami was saying but they could clearly hear the word Shanti being repeated three times. While 'advising' the river to calm down, Baba also raised His hands in a gesture of benediction. Miraculously, the flood waters began to recede immediately, and within a few hours, the people huddled in the Ashram could go back to their homes. There are also occasions when Swami emphatically refuses to intervene. Once during a Discourse, it was raining heavily. Devotees prayed that the rain be stopped but Baba brushed aside the request. He explained that while the rain might be an inconvenience for them, the farmers were eagerly looking forward to precisely this downpour. Devotees must not be selfish, He added. Who is the most beautiful of them all? There is on the stage in Sai Ramesh Kishan Hall in Brindavan, a beautiful brass idol of Krishna. Some years ago when the idol was delivered to Baba for installation, three people were there with Him. One by one He asked them what they thought about the statue. The first two said that it was very beautiful. The third person to be so asked was the Rajmata [Queen Mother] of the erstwhile Princely State of Nawanagar. Without a moment of hesitation she replied, "Not as beautiful as My Lord here!" The story has a moral. God may have a human form but God He remains; it is for the devotees to recognise His Divinity. Further, the Creator is always more glorious and grand than anything in Creation, however beautiful it might seem!